A clapper board to help me align video clips. A packet of chalk so I can write on the board. Three rock samples bearing fossils. Just by chance, later the same day your parcel arrived I had a phone call. I was asked if I was willing to video the opening performance of the Candelo Village Festival. I agreed and realised I had the chance to use the clapper board very soon after receiving it. The idea is to use this blog when I explain how or why I do things the way I do. I left two posts from March, 2012 because they looked at how to write a googol (special number where 1 is followed by 100 zeroes) and how I approach writing a story, particularly long ones. Your gift gave me an idea for the first post made especially for the blog. It tells how I used the clapper board. I have included a video clip I made for you showing me use the clapper board to mark the film position. I also included 15 seconds of a performance so you can hear a little of my experience on the evening of Friday (April 12). 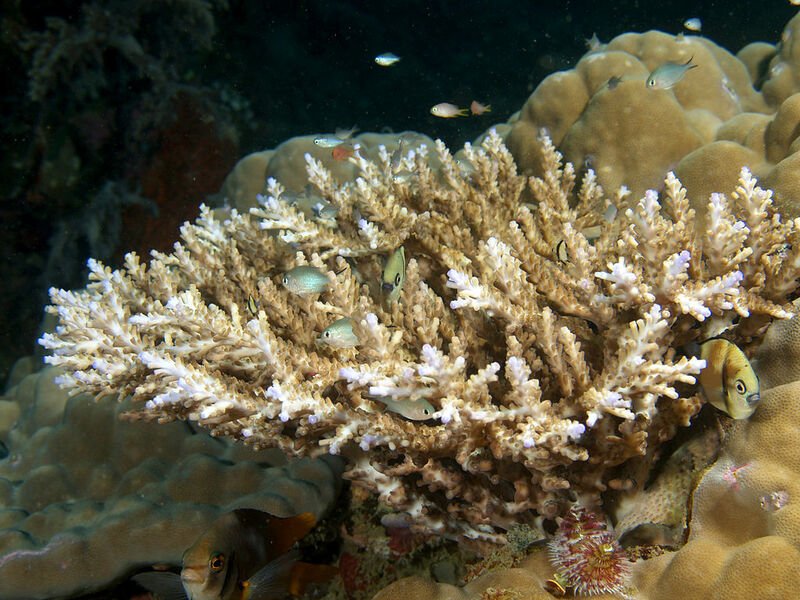 Corallite, if I have my information correct, is the fossilised remains of stony corals. 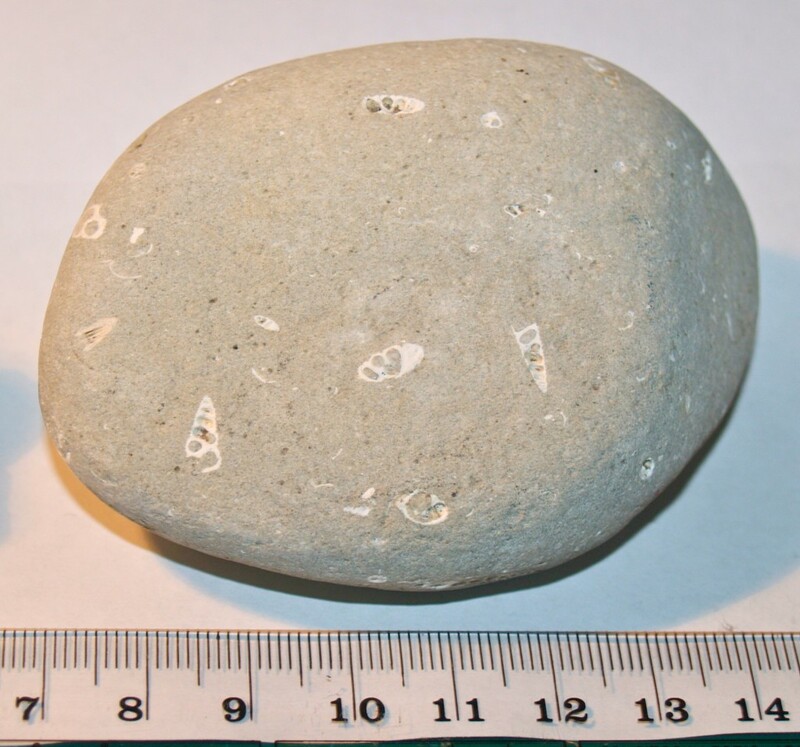 When you look at photos, you can see they are well formed, rock-like structures so I would expect fossils of them to include a more regular pattern than in the samples you sent (see the photo below). Of course, it is also possible what you see in the rocks are broken bits of coral cemented together in the way sedimentary rocks can form. 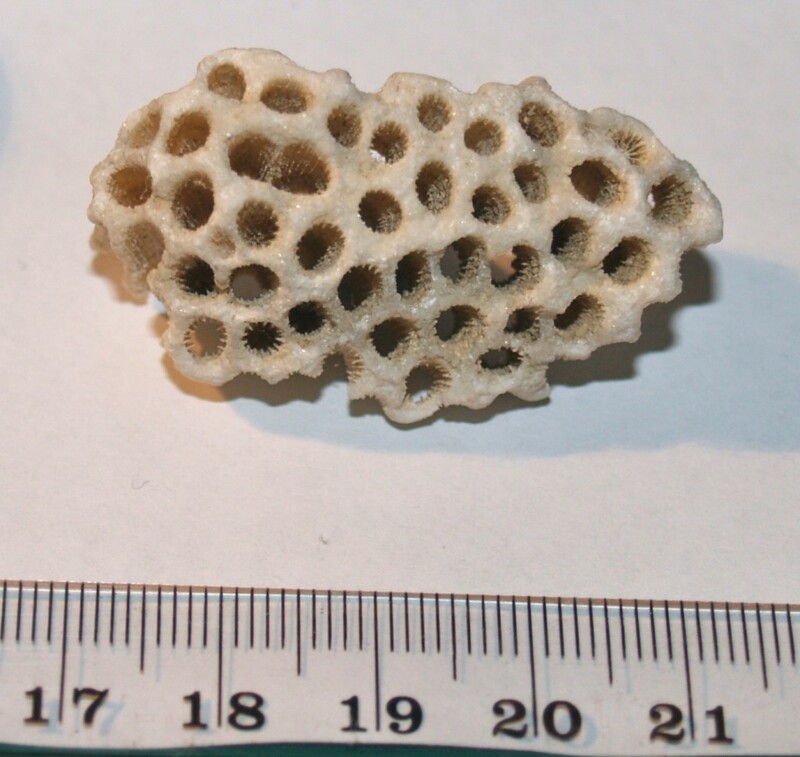 Below is a photo of a piece of coral I found washed up on the shore in Queensland. It came from the Great Barrier Reef. 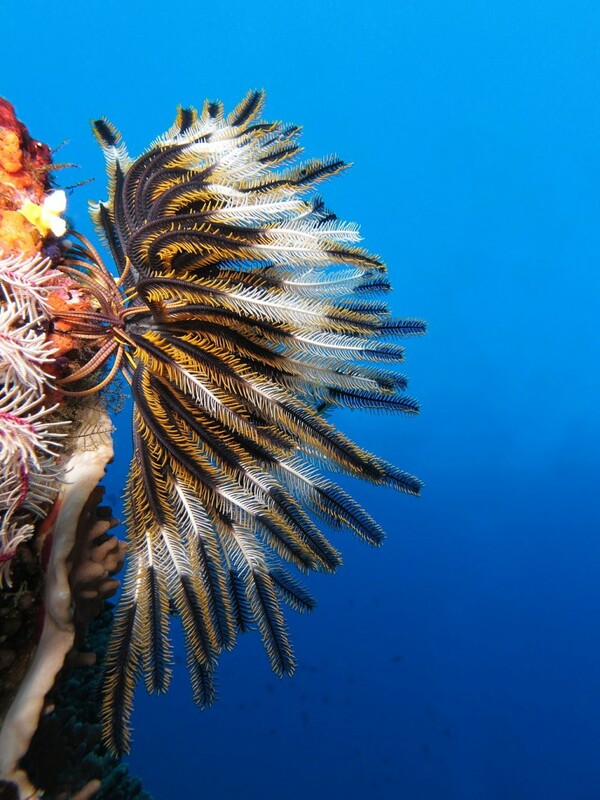 Can you see the pattern of openings where coral polyps once lived? Below is a rock I picked up on a beach. You can see, like the samples you sent, it has been rounded by water action. Can you see the shell fossils embedded in it? In these cases, you can see the shell was from spiral shell type similar to ones I sometimes find washed up on our beaches. Did I say "something sounding fossil-like" back there? I'll explain. You know my mind tends to wander in many directions and this is what happened when I saw the packet of chalk. The question came to mind, "What is chalk?" I thought I would share my answer with you. I took the above photo when I was in Dover in England. 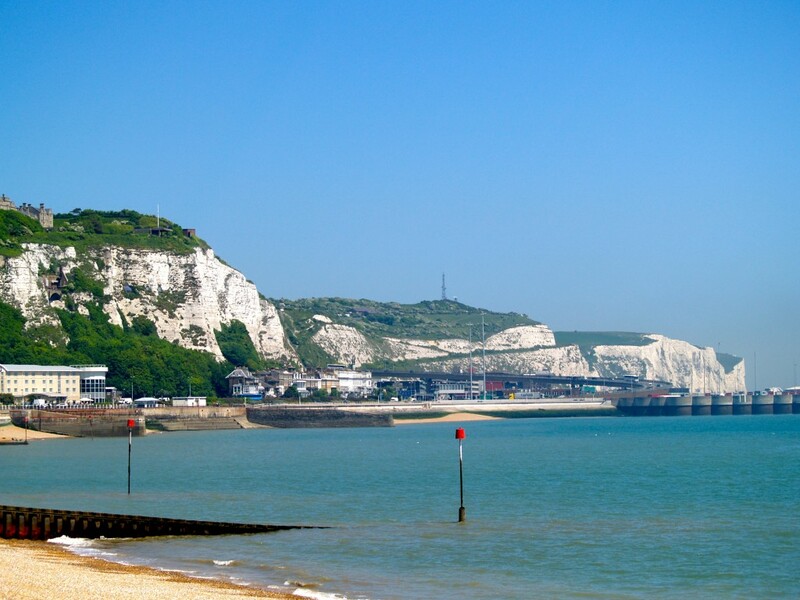 It shows the famous White Cliffs of Dover. The cliffs are chalk but what exactly is chalk? "Chalk is a soft, white, porous sedimentary rock, a form of limestone composed of the mineral calcite. Calcite is calcium carbonate or CaCO3. It forms under reasonably deep marine conditions from the gradual accumulation of minute calcite plates (coccoliths) shed from micro-organisms called coccolithophores." What this means is chalk has formed under the ocean from the remains of algae so tiny you would need a microscope to examine them properly. Can you imagine the cliffs of chalk in the above photo would have involved many billions of these tiny organisms over a very long time? What was the third option for the stones you sent? I can be a very curious person when seeing something interesting. This is what happened when I was looking at the rocks. I suspected I might not be looking at fossils in rock at all so I broke open the smallest piece of stone so I could examine its centre. I found the stone was made of small crystals. 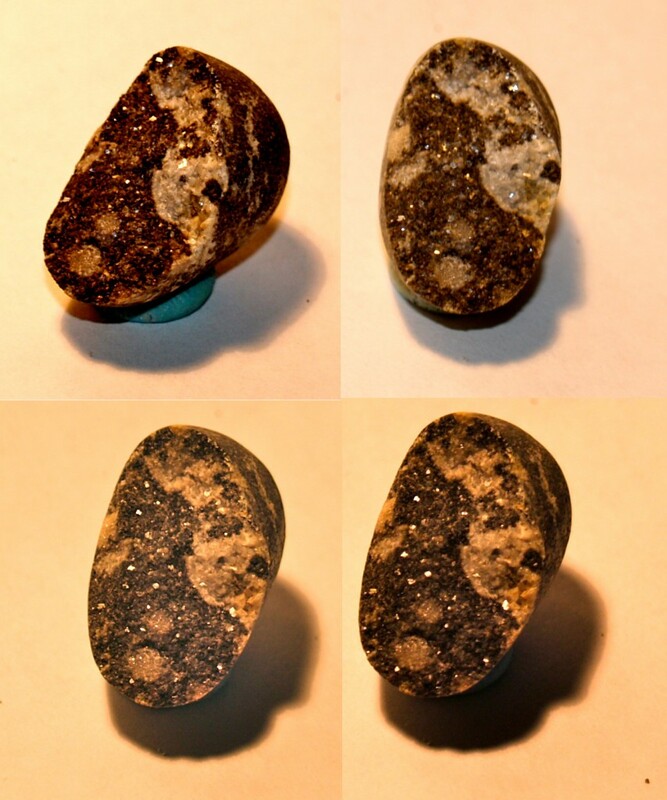 Below is a graphic showing four photos I took of one of the pieces of the small stone. Can you see the shine of the small crystals? Now I was really curious because I suspected the stone wasn't fossil bearing sedimentary rock. I thought it might actually be igneous rock, i.e. volcanic rock. 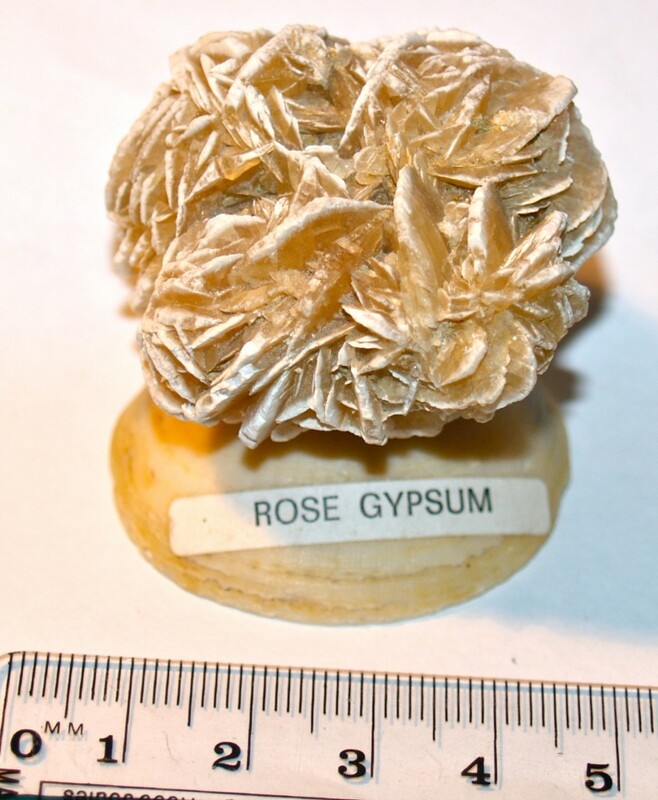 I spent more time searching my rocks and minerals books and the internet. I think I might have found what the stones could be. I think they might be diabase (aka dolerite). Below is a reference for diabase. Visit the site and look at their photo of diabase. Tell me what you think. Of course, I could be completely wrong but it is fun to try to find answers even if they're sometimes wrong. We can learn from both right and wrong answers if we keep our minds open. I just had an afterthought on rereading this post and thought I'd share. When I broke open the small rock and looked inside, I realised I was the first person to have ever seen what's inside that particular stone and now I'm able to share what I found. In your lives, you will have many first person experiences. Will you recognise them when you do? I wonder if that makes us all curiosity explorers a little like early explorers seeing somewhere for the first time? 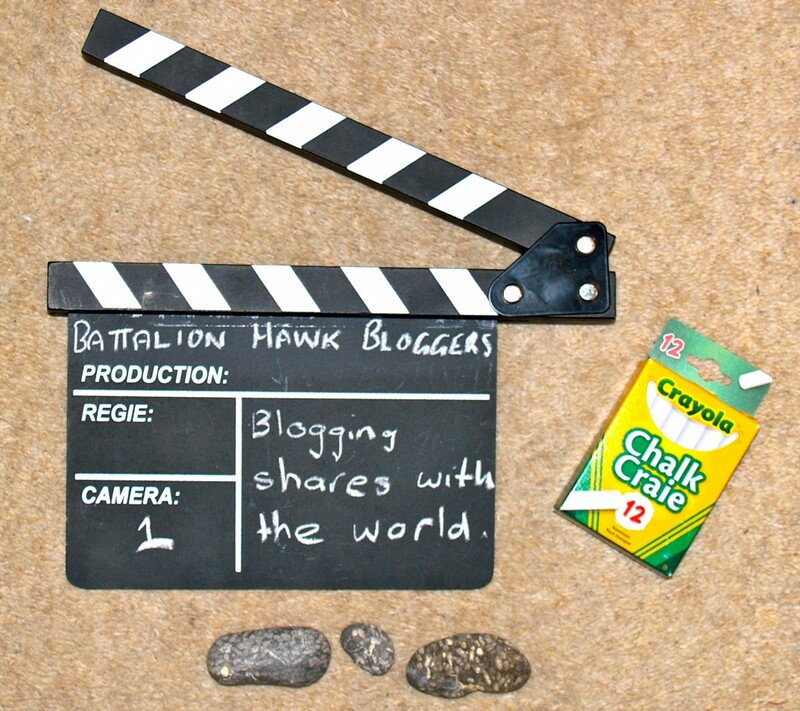 Posted in Cinema, Theatre and Animation, Fossils, Rocks and Minerals and tagged aligning video clips, chalk, diabase, dolerite, fossils, movie clapper board on April 15, 2013 by rossmannell. Thank you for your AMAZING comment! We are SO relieved that the parcel finally got there because we were afraid that it might have been lost! We think we ALL learned a lesson from this experience … don’t let Mrs. Renton make BIG decisions when she has a bad cold … especially when it comes to sending parcels overseas!!! Next time we send a parcel overseas, through snail mail, we should always choose “by air”!!! Lesson learned!!! We were surprised AND happy to know that you got to use the clapper board. We thought you might never actually use it … and put it on a shelf for display … it just felt GOOD to send you something special! We think it’s cool that on the same day that it arrived you were asked to film at the festival! It was perfect timing! It felt GOOD to see the YouTube video of you using the movie clapper! We are really GLAD that the rock samples we sent prompted you to do some MORE digging! We are really eager to find out what they REALLY are. Even some of the geologists we’ve had check these samples out don’t all agree! What you say … that they could be igneous rocks with crystals … makes sense! The link you sent for diabase was great. We’re STILL not sure! We think these rocks are a mystery … maybe we need Sherlock Holmes working on the case!!! We wonder how you cut the rocks so perfectly? Do you have a special tool? We think it COULDN’T have been a hammer because a few of us tried that and ended up with many, many pieces!!! It makes us feel SO good to know that some Alberta rocks have made it into your amazing collection, Ross! Who knows, maybe NEXT year, the NEW bloggers will find some DIFFERENT samples to send your way!!! One blogger thinks that we should do a whole post dedicated to asking the world to help us identify these mysterious rocks. What do you think? Thanks, Ross! We will probably keep coming back to this blog post of yours as we learn a little more. We love that your mind starts to wander and you further explore our questions. We always learn SO much from you! I must apologise for taking so long to answer. In between your comment and now, I have produced two more DVDs and taken a series of photos in a local national park. The DVDs were made for two towns. April 25 each year is ANZAC Day* for Australians and New Zealanders. I had decided to attend three memorial services on the day. The first was in my hometown of Merimbula. I attended the 6:00a.m. Dawn Service and was surprised with how many people were there. It was the largest crowd I can remember. At 9:00 a.m. I attended the ANZAC Day march and ceremony in Pambula about 5 miles (8km) from home. This was the first ceremony to be made into a DVD. At 11:00 a.m. I travelled about 18 miles (30km) to Candelo for another ANZAC Day march and ceremony to film for the second DVD. I am still waiting to hear from the organisers of the village festival. They need permission from the composers to have the DVD released. While the clapperboard doesn’t appear in the DVD, you will know it has helped me align video from three cameras. Of the five performances, two are favourites so I would love to be able to release the DVD. If the DVDs aren’t released, I may just be making a copy for the composers. One of the most interesting activities in science is trying to find out answers. When you think you have answers, you share with others and wait to see if others agree. The rocks were a mystery and a mystery is perfect for a Sherlock Holmes type of person. My search included finding some online geological surveys of your area in order to try to narrow down the type of rock. I found diabase is possible in your area although we call it dolerite here. Whether it is would need a geologist to confirm. I do have a geologist’s hammer. It has a large pointed end and a hammer end for breaking off rock samples and breaking them open but it wasn’t necessary for the rock I split. I used a normal screwdriver and a quick hit with a hammer to split the rock. It can be dangerous breaking rocks open as they might shatter and spray out pieces or fly off on being hit but the sample split cleanly. I think this was because it was made of many small crystals. A hit with a hammer would split it into many pieces but a sharp hit at one point can split some rocks. One of the advantages of blogging is the ability to share ideas and ask others to take part in learning adventures. A post about the rock might work but a geologist would probably need to have a piece to look at. Perhaps using the pictures I used in my post might help. As you know, I add “Schools and students have permission to use this graphic for non-commercial, educational purposes.” Under my photos and graphics if I am allowing their use.